Wendy’s is the latest fast-food chain to remove the soda option from kids’ meal menus. That means when parents drive through a pick-up window, they won’t see soda as an option on the menu board, but if they decide to order one, they won’t be turned down. The fast-food chain is the most recent to cave to pressure from children’s health advocacy groups. McDonald’s made a similar commitment to drop soda from Happy Meals in 2013, after partnering with the Alliance for a Healthier Generation, a group aimed at fighting childhood obesity. 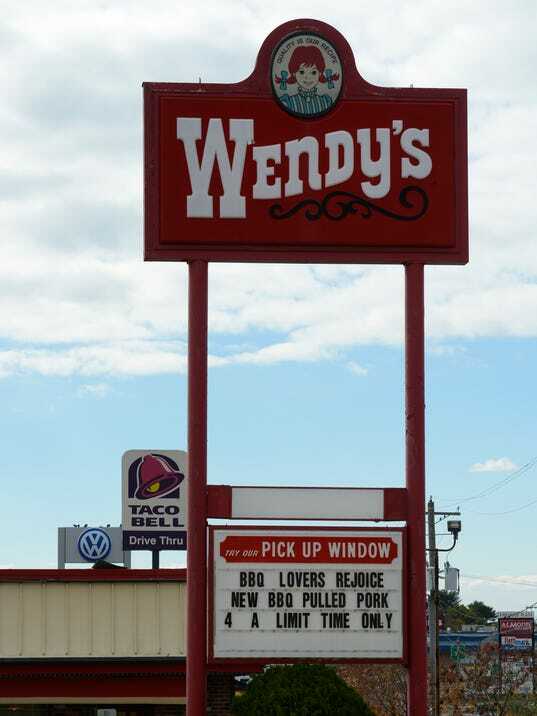 The Center for Science in Public Interest released a statement Thursday saying that Wendy’s was removing the soda option from menu boards and kids’ meals. Unlike some fast-food chains, Wendy’s default drink choice was never soda, Bob Bertini, a spokesman for Wendy’s said in an e-mail to USA TODAY Network. Bertini says the fast-food company began displaying images of “healthful beverage options,” including 1% white or chocolate milk, bottled water and 100% juice. He says the kids’ meal soft drink option no longer appears on the chain’s menu boards, inside the restaurants, at the pick-up windows or on the mobile app in the U.S. and Canada. While soda is no longer the default drink, it still remains one of the most profitable items for fast-food chains like McDonald’s and Wendy’s, according to Jesse Bragg, media director for Corporate Accountability International. Bragg says nothing will be solved until the marketing practices that draw kids to fast food is curbed. “It’s incredibly difficult to enforce on a local level in the fast food industry,” Bragg said. For children’s health advocates the battle is far from over. In the soda wars, other restaurants such as Subway, Arby’s and Chipotle do not offer soda on the kids’ menu. But, one of the giants is still left standing — Burger King. “Two down, one to go,” says Howell Wechsler, chief executive officer of Alliance for a Healthier Generation. via Wendy’s removes soda option from kids’ meal. Berkeley, Calif., a city long known for its liberal residents, has become the first in the United States to adopt a tax on soda. Voters overwhelmingly approved the tax in a referendum Tuesday. Across the bay in San Francisco, a 55 percent majority of voters approved a similar tax. But the referendum failed because it needed to win a two-thirds majority. The American Beverage Association and other lobbyists spent more than $2 million in Berkeley. But in the end about three-quarters of the vote supported Measure D.
Supporters of the tax say high-calorie sodas bear much of the blame for the epidemic of obesity in the United States and the increase in diabetes. A new study looked at whether America’s thirst for soda speeds up how the body’s cells age. Researchers at the University of California, San Francisco used a sample of 5300 healthy adults. Dr. Elissa Epel worked on the study for 5 years. “We think we can get away with drinking lots of soda as long as we are not gaining weight, but this suggests that there is an invisible pathway that leads to accelerated aging, regardless of weight,” said Dr. Epel. Epel’s team discovered that in people who drank more sugar-sweetened beverages, the ends of their chromosomes, known as telomeres, were shorter. The shorter the telomere, the less a cell can regenerate thus aging the body, and raising the risk of disease and early death. “This finding is alarming because it suggest that soda may be aging us, in ways we are not even aware of,” said Dr. Epel. Researchers found no link in cell aging, however, when drinking diet sodas and fruit juices. Concerned about possible health effects, former New York City mayor Michael Bloomberg lost a high-profile court battle to ban large sodas there. “I’ve got to defend my children and you and everybody else,” said Bloomberg. He’s now supporting a measure on the November ballot in Berkeley that would add a 1-cent per ounce tax on soda distributors. Thirty-nine states and the District of Columbia currently tax sodas sold in vending machines. Still, helped by ad campaigns from various groups, soda companies are on a 4-year winning streak. Thirty bills to levy or raise taxes on sugary drinks have all failed. The American Beverage Association declined an interview about the study, but insist the researchers did not find a “conclusive” link between soda and cell aging. Soft-drink sales have been declining for nine straight years. This is much more than a trend — it’s a fundamental shift in consumer tastes that poses a major problem for soda makers, no matter how diversified their product portfolios might be. The latest numbers are astonishing, but not surprising. Sales of soda fell 3% by volume in 2013, to the lowest levels since 1995, according to a report from Beverage Digest issued on Monday. That would be a big drop no matter what, but it’s also more than double 2012’s decline. People are moving away from soda at an accelerating rate. At this point, companies like Coca-Cola KO 0.34% and Pepsico PEP 1.01% must be judged not on what they’re doing to save their flagship brands, but on how well they’re managing those brands’ decline. Of course that’s not easy for companies that are named for those very brands, so they’re still going nuts trying to figure out how to at least staunch the losses, even as they wisely continue to invest in alternatives like energy drinks, sports drinks, and flavored water. Among many other initiatives, Pepsico tried a new bottle design for Pepsi, and it signed Beyoncé to a $50 million endorsement deal. Coke hired clothier Marc Jacobs as its “creative director.” Sales have continued to plummet. And the hoped-for savior of the business — diet drinks with artificial sweeteners — are no help. Up until a few years ago, sales of diet sodas were falling at about the same rate as the sugar-filled ones. Now they’re actually falling faster as consumers continue to hear about health concerns. Just yesterday, a study was released indicating that consumption of diet soda can increase the risk of cardiovascular disease in older women. At this point, companies like Coca-Cola KO and Pepsico PEP must be judged not on what they’re doing to save their flagship brands, but on how well they’re managing those brands’ decline. Of course that’s not easy for companies that are named for those very brands, so they’re still going nuts trying to figure out how to at least staunch the losses, even as they wisely continue to invest in alternatives like energy drinks, sports drinks, and flavored water. But health concerns are not the only problem. If they were, it would seem unlikely that energy drinks, sports beverages, coffee-based beverages, and flavored waters would be taking up the slack. But they are. That’s a further indication that what’s doing soda in is the proliferation of choices in the beverage aisle, especially those aimed at young people, an increasing number of whom think of Coke, Dr. Pepper, Sprite, and Pepsi — Beyoncé notwithstanding — as the stuff their grandparents drank in the olden days.